The town of Churchill, Man., is keeping children safe this Halloween by boosting ground patrol in the community to stave off bears travelling north for winter. A group made of Manitoba Conservation, RCMP, Parks Canada, Canadian Rangers, Manitoba Hydro and residents in Churchill team up every Halloween to ensure trick-or-treaters don't have any polar bear encounters. The town of Churchill, Man., is ramping up its polar bear patrol to keep children safe on Halloween night. Halloween is known as the most dangerous night of the year in Churchill. Not only is it the peak of polar bear migration; it's also when all the children fill the streets in pursuit of candy. "We're at the beginning of the busiest time of year for us when the bears will be coming through Churchill on their way north to the first ice on the Hudson Bay," said Brett Wlock, district supervisor for Manitoba Conservation. "It's important that people in Churchill and the trick-or-treaters are safe and can go about their business without worrying about bears entering town," he said. Thirty people are assigned to patrol units Saturday night, 10 of which will be stationary, while five will roam the town. Six people will be on duty throughout the night. 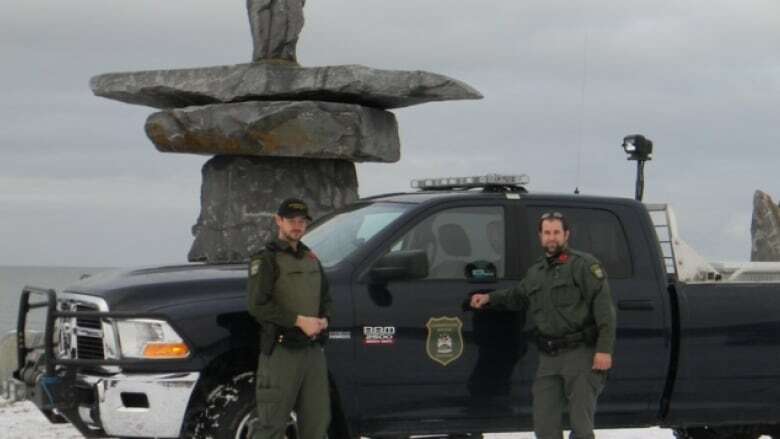 The patrols are made up of members from Manitoba Conservation, RCMP, Parks Canada, EMS, Canadian Rangers, Manitoba Hydro and the town of Churchill. Dozens of Churchill residents will also be out helping as well. There will be a helicopter surveying the streets from above, as well as bear traps set up at various high traffic points of entry for bears. Wlock said if any of the crews encounter a bear, they'll chase it to a safe location away from the public. "Just the presence of our vehicles and the horns on our vehicles ... a couple of the vehicles are outfitted with sirens or airhorns so if those work that's the easiest way," he said. "Otherwise we could use cracker shells, firing cracker shells; it's a loud bang and a flash that'll haze the bear away as well." The town even has a "bear jail," or holding cell, that's used to place bears in a 30-day time out, or until the ice forms, if they've wandered too close into town or were caught in one of the traps. "We're seeing a lot more of them in the last week or so," he said, adding he's seen six polar bears in recent days and one bear was caught this morning. Wlock said the carnivores are hungry and the ones who have ventured right into town are those that have found food and garbage there in the past. "This is the time of year when they're starting to get anxious and moving to the shorelines and hoping that the ice is forming soon," he said. The bears are moving toward the ice floes where they hunt for seals. "They're getting to that point where they're needing to back on the ice, living off their fat stores for the summer," he said. Wlock, who will be out on patrol Halloween night, said the most dangerous and scary thing is hazing bears on foot. "That's when you can encounter a bear at close proximity where you can't see it but you're trying to get closer to it and you end up closer than you want to be." And despite those harrowing encounters, he said it's worth it. "It's fun to see people out there ... doing Halloween normally," he said. "But it's also nerve-wracking as well.... We're responsible for keeping the bears out of the community and keeping people safe and we do that. "It's a very important job and we take it seriously."